A number specifying how much detail is to be recorded on a site, such as any feature bigger than 300mm (1 ft.) or any feature bigger than 25mm (1 in.) that is recorded, the accuracy of the record and how much of the site is recorded. The end product of each of these types of survey is the same; the site is recorded to known level of detail and known accuracy . An assessment survey is one that aims to get an estimate of the size, shape, layout and main features on a site, to assess what is there on the site to see if further work is needed. These surveys are used to provide information for rapid assessments of sites and by necessity they must be done quickly, the aim is to get enough information about the site as quickly as is possible. These surveys are sometimes done in advance of a Recording Survey to provide information for planning survey work. Often with assessment surveys the survey work is done using simple survey methods such as offsets and ties with spot depth or height measurements used to obtain an idea of the shape of the site. With this type of survey speed and efficiency are more important than detail and accuracy. Recording surveys include pre-disturbance and excavation surveys; this type of survey requires the highest accuracy and needs careful planning, measurement and processing so takes time to do correctly. High quality survey methods are required such as 3D trilateration and 3D photogrammetry with details recorded using simpler methods such as Offset and Ties. The first step for a recording survey is to set up a set of survey control points around and inside the site as these points are used as the framework for the survey and recording work. Once the control points are in place they can be used to position artefacts or structure or for helping to record details of the seabed. Permanent, fixed points called control points or control stations are placed around the outside of the site, if the site is large then points may also be installed through the middle as well. Find out more about survey points here. 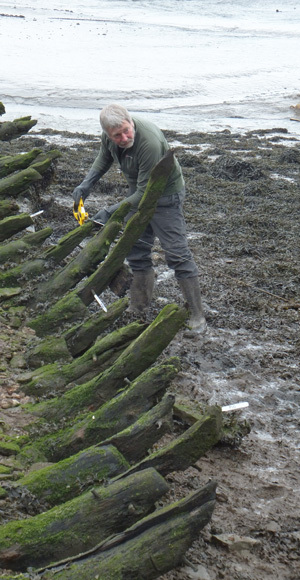 Recording the remains of ship's hulls and other structures can be time consuming. The remains may be too large to record using drawing frames but too detailed to record by positioning only a few survey points. Offsets can be useful in recording simple shapes but complex shapes can sometimes only be captured accurately using close-range photogrammetry. Recording the remains of harbours and civil engineering works can be difficult because of the size of the task so techniques used for recording topography are sometimes the most useful. With this type of survey detail and accuracy are more important than speed. Monitoring surveys are a special kind of recording survey where only selected parts of a site are recorded, these surveys are done to monitor changes in the site over time. Not all the site need be re-surveyed each time, only small parts thought most likely to indicate change. A typical example would be to monitor the position, attitude and remains of a stern post on an exposed site or the depth of burial of a site under mud. To be correct the term precision should be used rather than accuracy, but accuracy is used as the meaning is more widely understood.